I grew up in an active family. My two brothers and I all played various sports as kids and my parents, now retired, are still very involved with a local hiking group. Our vacations usually included some sort of active or outdoor excursion, providing me with fond memories, the random sprained ankle—I’m active, not graceful—and a deep sense of fun and adventure. So it’s no surprise that I married an athlete. My husband, Rick, and I try to give our kids—Nick, 14, and Sophie, 12—the same kind of adventures we both had growing up. Luckily, Rick, Nick and Sophie are always up for the fun. 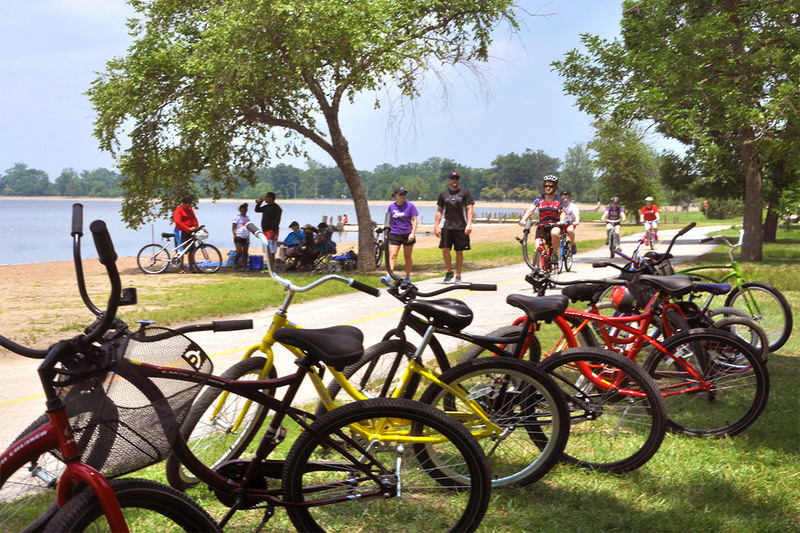 Creve Coeur Park, with its lush woodlands and gorgeous lake, was the perfect place to start our adventure. Eager to jump right in, we headed straight for the Go Ape Treetop Adventure Course, right in the heart of the park. “You’re not scared are you, Mom?” Nick asked me with a sarcastic grin as we all strapped into our harnesses. He knew heights weren’t my favorite. We traipsed over wobbly rope crossings, across swaying Tarzan swings, up challenging treetop obstacles that led higher and higher until we finally ended up breathless at the top of the bright green forest canopy. Rick and Sophie joined us shortly after, and we all took a moment to enjoy the gorgeous scenery. The forest felt so distant and quiet, so secluded, so peaceful. That is until Nick shouted, “The race isn’t over. First one to the bottom wins!” He gave his best Tarzan yell before jumping from the platform and soaring down the zip line ahead of me. After picking up lunch nearby at Big Baby Q, we made a beeline to the lake for a picnic. Post-lunch, Rick rented three kayaks, and Sophie and I hopped in one together. We pushed off from shore with the wind at our back and the sun glistening off the surface. The water lapped gently against the side of the kayak, and I sighed contentedly. “That’s my second favorite sound in the whole world,” I said to Sophie. “Second favorite? What’s your first,” she asked with her trademark giggle that still reminds me of her as a toddler. “That. That giggle right there is my very favorite sound,” I said with a sappy smile. “Mooom!” Sophie gave a big eye roll. The toddler disappeared and the preteen returned. Although, I swear I saw a hint of a satisfied smile when she turned around and put her oar in the water. 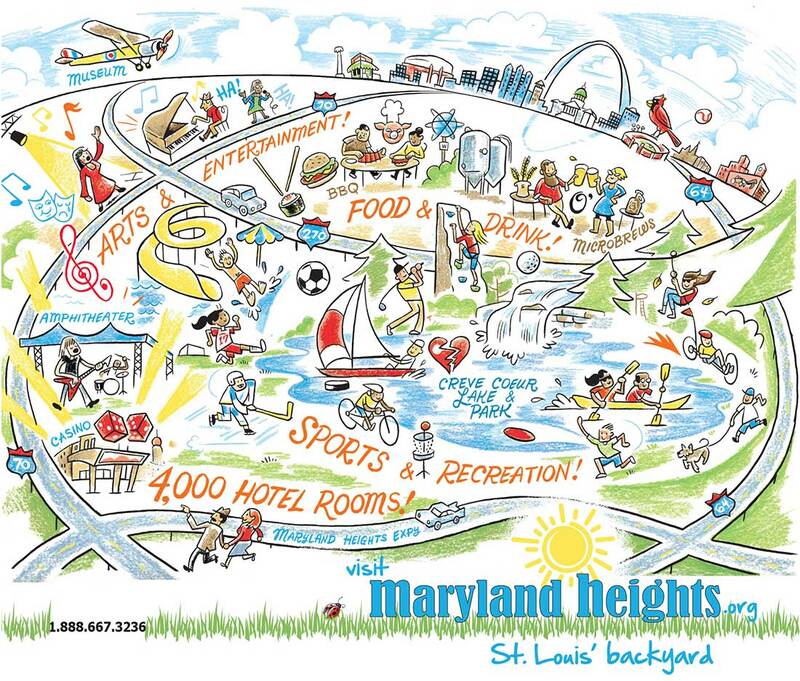 The next morning, after celebrating a big St. Louis Cardinals win the night before, we drove to Upper Limits Rock Climbing Gym in Maryland Heights. Rick had climbed a lot in his college days, but it had been a while and he was anxious to get back on the rocks. It all seemed to come back to him pretty quickly. As soon as he was harnessed in, he shot up one of the tougher routes like no time had passed at all. “Nice, Dad!” Nick cheered as Rick rappelled down. “You’ve still got it, hon,” I told him with a pat on the back. Apparently he wasn’t too worried about soreness, though, because he spent the entire morning helping the kids scout out various routes around the gym, some of them with pretty challenging holds. The grin on his face told me he was in heaven, but I knew his muscles would be aching soon. The kids cheered in agreement, and Rick gave me a grateful smile. 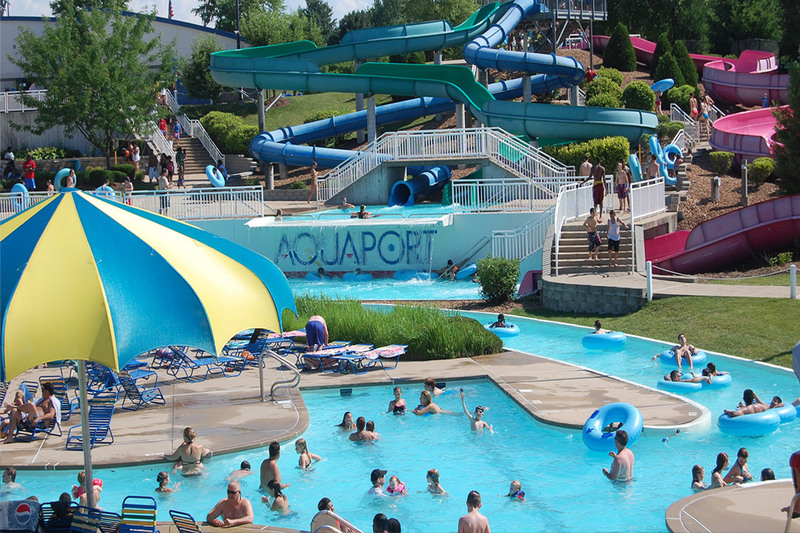 Aquaport, Maryland Heights’ outdoor water park, was the perfect way to end our weekend. We grabbed a quick bite to eat at the concession stand before we headed to the pool area. I’d envisioned a nice relaxing afternoon catching some rays, but when we saw the slides and the giant blue and yellow “Extreme Bowl,” all thoughts of a poolside nap were gone. We hopped on a slide that shot us straight down into the enormous funnel-shaped bowl, where we swirled around and around until finally we dropped into the pool below. After racing down tube slides, flume slides and the Extreme Bowl several more times, I finally surrendered and just decided to float for a while on the Lazy River. After a bit, the kids and Rick joined me in the soothing, cool water for a rest. “This weekend was a great idea, Mom,” Nick said with a teasing splash.